It was Tobie who picked up the various books of The Strain Trilogy given his appreciation for Guillermo Del Toro. I totally wouldn't have heard about this project without him. But given how he's never been all that big on reading fiction (unless it's RPG-related), I ended up reading more of the books in order to keep pace with the TV show. And given how the first season seems to go beyond the events of the first book, I started to play catch-up by reading this title. The Fall continues this rather unique take on the vampire mythos. And while there are still aspects of the book that are more along the lines of fantasy including these truly ancient vampires and such, the series started with a greater effort to characterize this as some sort of virus. And thus the initial approach to discussing the contagion was more like dealing with an outbreak. But this second book had to go and continue on with the plot, which means a lot less discussion of the scientific implications of vampires. And while the first book had felt a little stretched at some points in terms of overall content, this second title at least felt like it had a lot more to get done. 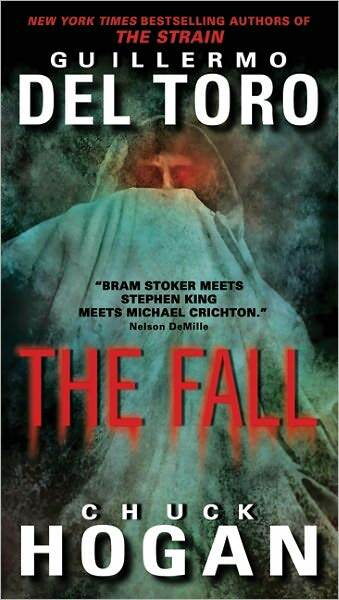 Synopsis: The Fall was written by Guillermo Del Toro and Chuck hogan and is the second book in the Strain Trilogy of vampire horror novels. There appears to be little to no hope of containing the vampires to Manhattan at this point as reports of strange riots and related incidents are now cropping up all over the world. The confrontation between The Master and our little band of heroes did not end as well as hoped but at the very least they were able to hurt him. And now their best bet is to try to locate the Master as quickly as possible in the hopes of delivering the killing blow against him. But Dr. Ephraim Goodweather is more and more concerned about the safety of his son Zach, especially since they now know for sure that his wife Kelly has been turned into a vampire. The elderly Abraham Setrakian also has another angle of investigation he hopes to pursue - that regarding an almost mythical tome known as the Occido Lumen. This book bound in silver is said to contain ancient histories regarding the vampires and the elusive Massive that they hope to defeat, but the silver bindings ironically keep it out of vampiric hands. And it seems that the book has been found and is going up for auction despite the madness going on around the city - a rather strange coincidence given everything that has happened so far. But Setrakian firmly believes that this book is a major key to finding a way to defeat the Master. As is the challenge of middle books in trilogies, at first it seems like our protagonists don't have all that much to do. There's a lot of shuffling around and moments of tension that lead to nowhere. We even have some annoying incidents of characters doing stupid things because the group includes an older woman and a young boy. But one has to deal with such challenges in order to get to the better parts of the story. But this book also included some strange innovations that I don't think really fit well with the narrative. There was some effort to be a bit more creative in presenting the story beyond mere basic narrative paragraphs, and that isn't necessarily a bad thing. But to have a more or less action-oriented character like the rat catcher Vasiliy put up a blog about his thoughts as a really weight move. I think I would have been a bit more okay with Zach posting his thoughts on the internet since he's largely bonded to his phone this whole time, but Vasiliy? Really? And did having us read these blog posts really move the story forward? These asides just struck me as odd and just didn't quite fit the overall narrative. Zach has become a really annoying character this time around. He wasn't too bad in the first book and at least felt like he had something to contribute. This time around he mostly felt like one of those characters that you need to keep safe in a video game. He barely speaks, spends most of his time listening to music on his iPod (and who still has iPods?) and seems to just get shuffled from plot point to plot point. It goes without saying that it's pretty clear he's going to get lost sooner or later. It's only a question of time. There's a side plot regarding the other Ancients and their response to the incursion by the Master, but that didn't quite get as addressed as I had hoped. Instead we get mostly scenes of generic vampire vs human combat and little else. There are very few scenes with the Ancients themselves and you'd think that they'd take a slightly more active role in things given all the chaos going on around the world. And of course there's the Eldrithc Palmer angle that wasn't too great in the first book and really got muddy this time around. The Master's big plan involving Palmer was always a little strange and it was never immediately apparent why the Master let him live this long. He never really appeared to be all that useful and spends most of his scenes whining about his looming death or demanding that he get what he is due. On the whole, the book is still okay and there are far worse titles out there, but it just doesn't accomplish much. The first book was exciting as it set the stage and presented vampires in a very clinical fashion. But now that we know what works in terms of killing them, it seems the old lore has triumphed and it's back to using silver bullets and decapitating the vampires instead of any larger solution. Eph seems to have given up being a doctor and instead is trying to keep pace with more experienced killers like Vassiliy. The Fall suffers from all the challenges of being a middle book with the added struggles of weird narrative decisions and poor characterization for background players. There's definitely a certain "visual" appeal to all the scenes involving fighting the vampires, but too much can be a bad thing. So this second book in the Strain Trilogy gets 3 surprise vampires out of a possible 5.